Fortnite 3.5 Content Update Released | Nerd Much? Epic Games has released the 3.5 content update for Fortnite today. 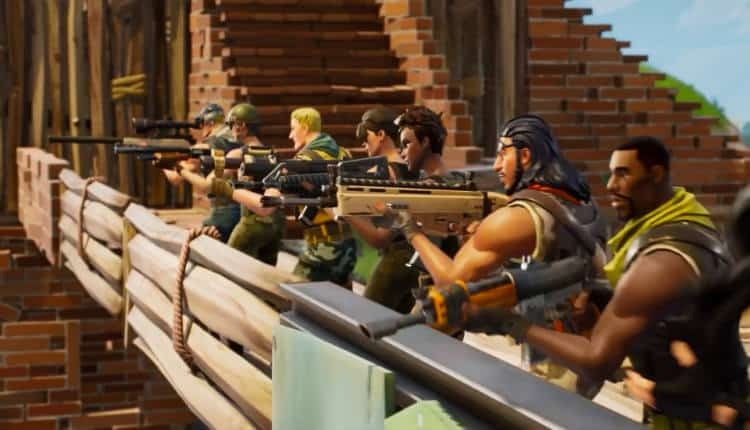 Battle Royale players are now able to experience 50 v. 50 matches once again. And a new gun is hitting the battleground. 50 v. 50’s reintroduction as a Limited Time Mode is an awesome distraction from the base game to many. And things have changed since we previously saw the unique format. Each team will have a separate bus which approach the island from opposite directions. Teams will also be able to see where the final storm will be located beginning at the start of the match. Players will have 10 minutes to scour the map for loot. The storm will then continue to shrink in on the battlefield every 5 minutes. Supply drops will be more frequent. As will be loot farming, weapons, ammunition, chests and ammo boxes. It sounds like Epic is aiming for all out chaos. The 3.5 content update is also introducing a new weapon for Battle Royale, the Light Machine Gun. Epic says that the gun’s uniqueness stems from its fast rate of fire and 100 round magazine. It’s the perfect weapon to prevent enemies from rushing your bases. The new weapon will be available in Rare and Epic iterations and found via floor loot, chests or vending machines. Shots do 25 or 26 damage depending on which version you get. The gun will require a 5 second window to reload. Epic is ready to hand out their “I’m sorry” following the roughly 24 hour window in which servers were down last week. Upon logging in following the 3.5 content update, players will be greeted with 20 Battle Pass Stars in Battle Royale and 1,600 Season Goal in Save the World. Epic is now utilizing an update model which features bug and game improvement tweaks with one update and new content the next. We’ll check back in to see what new Fortnite content is headed our way in a couple of weeks.